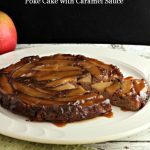 Paleo Apple Cinnamon Poke Cake with Caramel Sauce is grain free, with low carb and dairy free options. I love caramel apples but they do not love my teeth or my waistline. 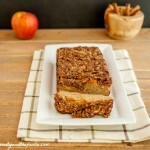 I wanted to get some of that caramel apple flavor into a apple cinnamon cake, but still have it be grain free, paleo friendly, and have a low carb option. 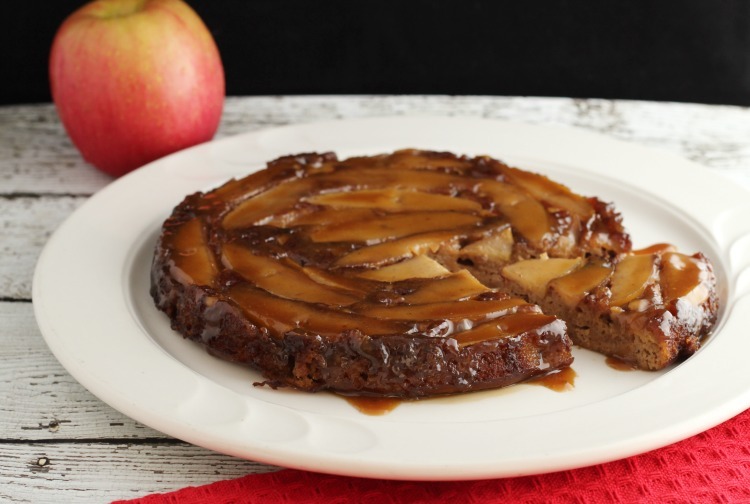 I made an apple cinnamon upside down cake, then I poked holes in the top and poured caramel sauce over it. But of course, you can just eat it as an upside down cake, without poking holes or making caramel sauce. I really liked how the caramel sauce turned out, and think I might need to put it on coconut milk ice cream or on other treats. I have been eating this cake with breakfast and it is perfect with the morning coffee. My family (the food critiques) all agreed that this cake is a keeper. It is so much easier than making an apple pie. The cinnamon and nutmeg in the cake smell amazing while mixing and baking. 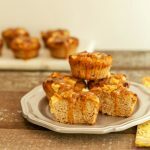 Cinnamon and nutmeg have so many amazing health benefits, as well as adding delicious flavor to this cake. I listed some of the health benefits, so you can feel even better about this healthy cake. 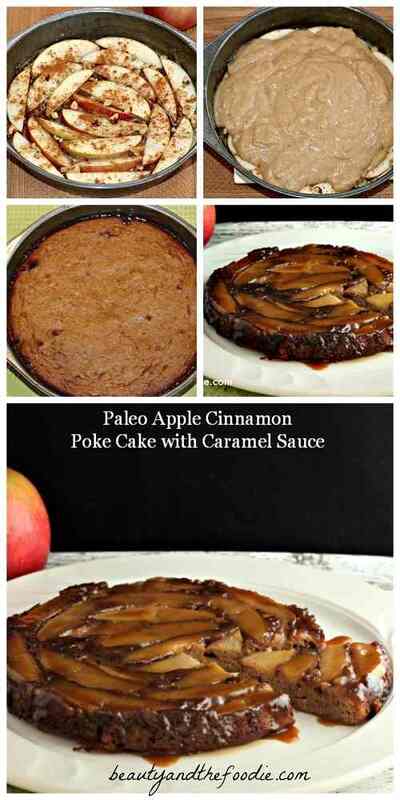 A paleo , grain free apple cinnamon caramel cake with a low carb version. Preheat oven to 350 F, and grease or oil a 9 inch cake pan or 8x8 baking pan. Making the bottom fruit layer first. Place 2 ½ tbsp melted butter or coconut oil in the bottom of pan and swirl around to cover the bottom of pan. Sprinkle 2 tbsp of sweetener of choice all over melted butter or oil in pan. Layer apple slices over the bottom of pan on top of the butter and sweetener. Sprinkle the apple slices with optional walnuts and ¼ tsp cinnamon. Set aside. In a large mixing bowl combine all the ingredients for the apple cake: 3 eggs beaten, tbsp unsweetened coconut milk or almond milk, ⅓ cup unsweetened apple sauce, sweetener of choice: ⅓ cup pure maple syrup (paleo), or for low carb use ⅓ cup low carb maple syrup + 20 drops liquid stevia, 1 tsp GF vanilla extract, ½ tsp cinnamon, ½ tsp nutmeg, ¼ tsp sea salt, ½ tsp baking soda, 1 tsp apple cider vinegar, ½ cup coconut flour, sifted, adding coconut flour last. Stir vigorously while scraping the sides of bowl. Be sure to break up any coconut flour clumps. Once thoroughly combined, pour or spoon cake batter over the apple fruit layer in the pan. Spread cake batter around evenly. Bake at 350 for 35 to 40 minutes, or until center of cake is done. Can make optional caramel sauce while cake cools, or if skipping caramel sauce then can turn cake upside down on a plate once cooled. 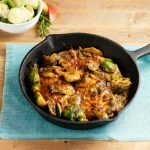 In a small sauce pan over medium high heat combine and melt: 2 tbsp butter or coconut oil, 3 tbsp heavy cream or coconut milk, and 2 tbsp sweetener of choice (do not add vanilla extract yet). Stir continuously while heating to a low boil. Once at a low boil remove from heat. Add and stir in the ¼ tsp vanilla extract. Use a butter knife between cake and side of pan to slide around and loosen cake.Take a large plate and put over the top of cake pan, and turn plate and cake pan over. Making cake upside down with fruit now on top of cake. Poke holes all over top of cake with metal or bamboo skewer. Pour or spoon caramel sauce over top of cake. Slice and serve. Store unused portions in the fridge. This was a great cake. It was so yummy. I used maple sugar for the caramel sauce and it was so good. Definitely would make again. Joy, thanks for trying the recipe. 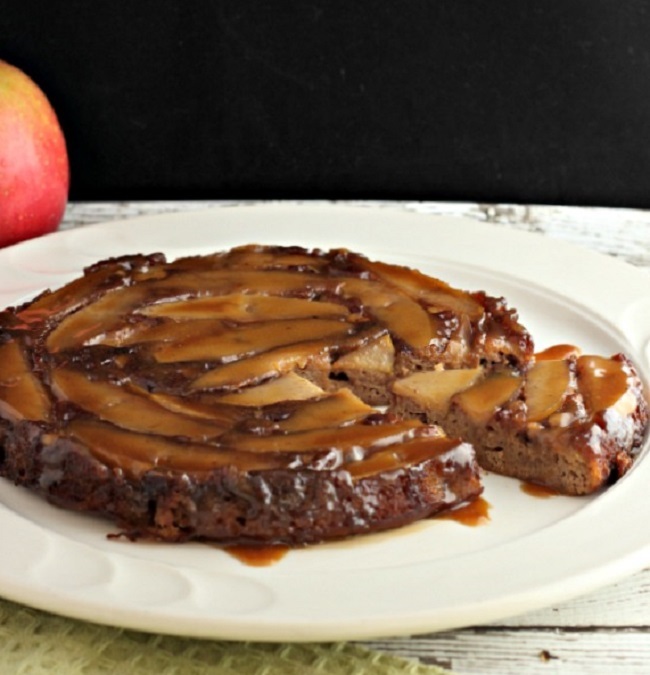 It is not a super low carb recipe, but is fairly low carb as compared to other Apple cakes. What can I use if I can’t get low carb maple syrup? Also how much sweetness are you aiming for in each part compared to sugar? If I know the equivalence to sugar I can sub any sweetener. I like liquid sucralose. I don’t live in the US and haven’t seen low carb maple syrup here. Sunny, I think you will like it. What makes this recipe “Poke”? I understand the Hawai’ian word “poke” means “to cut” and refers to an island dish of chopped raw tuna with other ingredients. I also understand “Poke Weed” and Poke Salat or Salad, both of which are now largely gone from the culinary world because prepared incorrectly they can kill you. But it seems to make no sense in connection with this recipe. Ken, in the post and directions, it shows that a poke cake is a cake in which holes are poked with a skewer, so that the caramel sauce, when poured over the cake will get the caramel throughout the cake. There is not “Hawaiian Poke” in this cake or the poisonous weed you mentioned. Is that really only… ½ large apple, cored and sliced… in the photo or did you use more to photograph well? Jeani, It was half of possibly a slightly over-sized apple, and I did slice it very thin. But I use a macro lens which makes the slices look bigger and thicker. I use it because it captures small details in food, although it does make items look bigger than the are in person. I make sure not to photograph people with that lens, lol.